"When I tried to play something and screwed up, I'd hear some other note that would come into play. Then I started trying different things to find the beauty in it." He was best known as a founding member of the heavy metal bands Pantera and Damageplan. Abbott also contributed to the album Rebel Meets Rebel, a collaboration between Pantera and David Allan Coe. He started to play guitar when he was 12, and his first guitar was a Hondo Les Paul. He won a series of local guitar contest mostly held at Dallas.He was invited by Dave Mustaine to join thrash band Megadeth. Abbott was willing to join, but on the condition that Mustaine also hired his brother Vinnie on drums. As Mustaine had already hired drummer Nick Menza, He stayed with Pantera. He once said in an Interview that if there were no Ace Frehley, there would have been no "Dimebag"
At first Darrell wanted to play drums however discovering that he wasn't as good as his brother, he decided to play the guitar. Nickelback's song "Side of a Bullet" features lyrics dedicated to Darrell and one of solos. 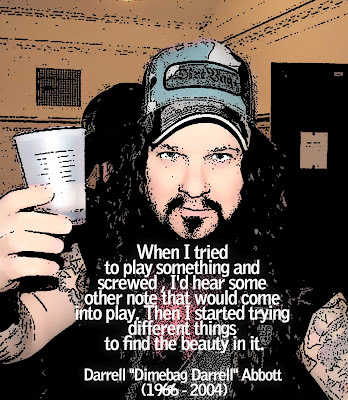 Dimebag was the lead guitarist in the bands Pantera, Damageplan, and Rebel Meets Rebel. playing the guitar longer but his skills surpased theirs. Among Darrell's influences were KISS, Judas Priest, Iron Maiden, Randy Rhoads, Eddie Van Halen, Ace Frehley, and Pat Travers. Darrell has a tattoo of Kiss guitarist, Ace Frehley on his chest. Darrell was willing to join, the pre-Rust in Peace Megadeth by Dave Mustaine but insisted on Mustaine also hiring his brother Vinnie. Darrell turned down his offer because he couldn't hire Vinnie. Darrell is known as the "5th member" of the band Anthrax, for his collaborations in many songs. Dimebag is son of country songwriter Jerry Abbott. About Cemetery Gates Darrell: We've always done a bunch of musically diverse things. We were just showing a broader side of the band, the more melodic stuff we do.